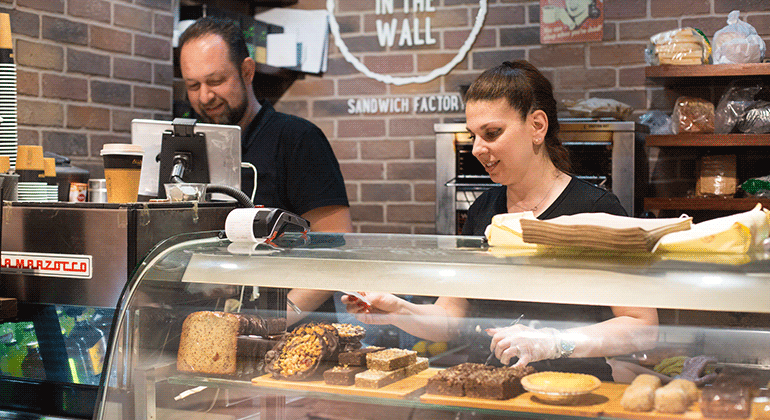 The name of the business sums up its size and location – Hole in the Wall is located next to the lift in the lobby of a busy legal area in Sydney CBD. It operates Monday to Friday for the pre-work breakfast and lunch markets. “About 90% of our customers are regulars and of that about 80% are from the local business community outside of this building. We started using our own branded app through YQme in 2013 and with active promotion and education, have grown the app orders to nearly 50% of all our business orders. Yes, last year we had our 50,000th order and celebrated with our customers both in-store and online on social media. We don’t have our own website – no need to, as YQme provides it, if you want it, as part of the package, the app and a menu website. With online ordering, a lot of people order early so we can prepare a little in advance and deal with other customers who come to the counter. We have a system behind the counter; we group similar orders to make it fresh. Sometimes customers turn up early and see it is being made. It works for them they’d rather not wait. The key is not to abuse it and make everything ahead and have it sit there….it has to be freshly made. It’s all about training and education. A lot of people think you just put the online system in, the printer there, and it will work on its own. It doesn’t. You have to let customers know about it, about the benefits and how fast and easy it is. The key here is everyone is time poor, they just want to eat their lunch and go back to work. So they just want to have lunch without losing their momentum in work, without losing focus. YQme has provided some marketing material and I leave the flyers in front on the counter near the cash register. When I see people coming in – first time people, or regulars who don’t know the system – and they sometimes have to wait for up to 10-15 minutes for a made-to-order sandwich, I show them the app. Often while they are waiting, they see other customers turn up and grab their order. So then I just say look, save you waiting, grab that flyer, take it with you, download on your phone or get it on your desktop it’ll save you time next time. I do a lot of catering through YQme. It’s probably the only online ordering solution that allows people to order ahead as far as they like. It works for customers and it works for me – better planning of resources. The catering menu features as another option on the main menu – people have to order by 2pm the day before they want the order. The YQme system has so many features that helps you work more efficiently and others don’t provide that. I’ve been offered a million different systems…. There was one that doesn’t allow you to order ahead, there are others that even though it’s an online ordering system, it’s not set and forget – you have to constantly watch it and say ok confirmed. Another major advantage of YQme is the pay-at-the-counter option, others don’t offer it and customers want it, even with credit card and account options. It is also so easy to manage – for me it is quite simple to make menu changes or order delay changes. Most other systems don’t even allow you to do it yourself – you have to ring them up, speak to their IT team, and then they say ok won’t be ready for a couple of days. I can do it if I want over night, I can do it in 5 minutes, I can step aside and even do it off my mobile. I can do an update or a change, I don’t have to ring anyone, I don’t have to wait for a marketing team. It’s just simple. And with YQme you are building your own customer database – so now I have something like 1,600 people to market to. I highly recommend YQme to other businesses.